In a meeting of the Egyptian parliament's ‎human rights committee, Deputy Foreign ‎Minister for Human Rights Laila Bahaaeddin ‎accused the Obama administration of ‎painting a "bleak view" of the ‎human rights situation in Egypt. The ‎foreign ministry said it decided to give a private ‎response to the report. The report, mandated annually by congress and put together by staff in US embassies, was released earlier this month, documenting human rights conditions in nearly 200 countries and territories. This year's report was largely compiled under President Barack Obama's administration.The report said Egypt's "excessive use of force included unlawful killings and torture." The foreign ministry responded at the time in an official statement, saying the report was not based on any "legal frameworks," and that "human rights conditions in Egypt are held to clear constitutional obligations and are being monitored by national Egyptian organisations, both governmental and independent." On President Abdel-Fattah ‎El-Sisi's visit to Washington next week to ‎meet with new US president Donald ‎Trump, Bahaaeddin said "as we see, Trump is different from ‎Obama and has said he wants closer ‎relations with Egypt." "As we want to open a new page ‎with this administration, we decided ‎not to make a lot of fuss in the media on a ‎negative report which was issued by the ‎outgoing administration of Obama,"‎ she added. Bahaaeddin said however that Foreign Minister ‎Sameh Shoukry, who will be part of El-‎Sisi's official visit, ‎will give a detailed response to the report. Bahaaeddin's words, however, were seen as highly insufficient by most MPs. Alaa Abed, head ‎of parliament's human rights committee, ‎said "the US State Department's negative ‎report about the situation of human rights ‎in Egypt reflected the political view of ‎Barack Obama who was supportive of ‎political Islam movements, especially the ‎Muslim Brotherhood." The report cited the most significant human rights concerns in Egypt as "excessive use of force by security forces, deficiencies in due process, and suppression of civil liberties." Abed slammed the foreign ministry for ‎what he called "its very brief and ‎incomplete" response to the US State ‎Department's report. Abed said the US State Department's ‎reports on human rights in general reflect ‎‎"a radical liberal viewpoint." 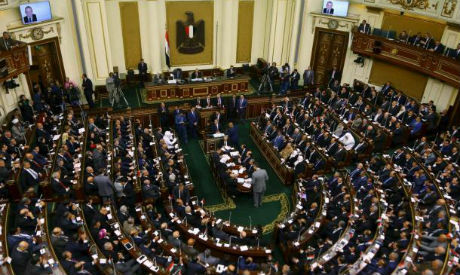 The report said that due process problems in Egypt included "the excessive use of preventive custody and pre-trial detention, the use of military courts to try civilians," trials without evidence and arrests without warrants. Civil liberties violations included societal and government restrictions on freedoms of expression and assembly, the report said. Nabil Bolous, a Coptic MP, ‎asked the foreign ministry to take the ‎matter as a national security issue, complaining that the report is rife with lies, particularly in the area on sectarian tension. In response, Bahaaeddin insisted that the ‎foreign ministry is doing its job.